At the MCRRC Turkey Burn-Off 10 miler I'm Hilary Swab Gawrilow's rabbit for the first few miles, until she pulls ahead to beat me by more than a minute. The weather is brisk, near-freezing. 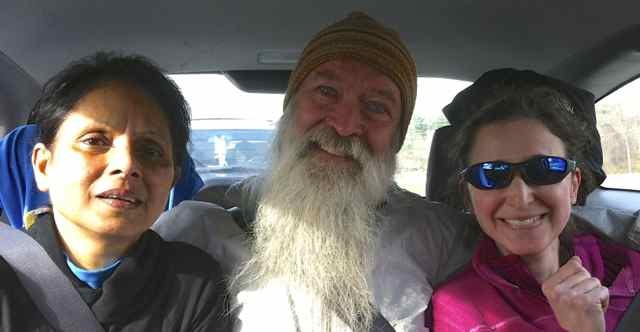 Barry Smith and his daughter Natalie Sayth kindly pick me up, then get Rebecca Rosenberg and Gayatri Datta. We carpool cozy to Seneca Creek State Park. Ken Swab, Don Libes, and Emaad Burki are also racing today. Official MCRRC race results have me in 84th place overall among 245 finishers, 67th of 141 males, 3rd of 10 in the male 60-64 year group, with chip time 1:18:52 and gun time 1:19:11. Six year old Jason Parks passes me in the final mile and finishes 8 seconds ahead on gun time, but since I started 17 seconds farther back in the crowd I come out in front of him by 9 seconds chip time. Hilary begins the race with me and zooms ahead about mile 4 when I pause at a water stop.